With Christmas 2010 fading into a glowing and happy memory, we now anticipate 2011! I have not yet even taken down my Christmas decorations, but already I am excited about the release of Book Two~The Angel’s Song, as well as the release of the CD featuring original music composed by my son, Nathan Allen Pinard! Both will be available to purchase in Spring of 2011! In anticipation of this event, just for you, my faithful readers, I am posting the following excerpt from Book Two. Hopefully this will whet your appetite for more!!! Please note that this excerpt falls somewhere near the middle of the book. Her words ricocheted like a gunshot in his mind, and he gasped audibly as if she had struck him a physical blow. He gently relaxed his grip, lowering her down to her feet, as his mirth dissolved with the sight of her flaming cheeks and streaming tears. Reaching out with the back of his hand, he brushed a tangle of damp curls away from her forehead, ashamed of himself for her miserable state. He had not intended to humiliate his beloved, but he was desperate to prolong their time together. Even in battle and at odds with each other, every moment spent with her was a revelation. Just to see her there in his home once again; to hear her voice and to touch her body…but he had allowed things to spin out of control and his amusement had been at her expense. For some moments, Erik simply stared blankly ahead, his eyes focusing beyond her. He had heard her speak audibly with his ears, but her words refused to register in his mind. They jumbled and flitted through his thoughts chaotically, leaving him staggering on his feet and trying to make sense of what she was saying. She wrung her hands together and her face was red and puckered with the force of her tears. “I will only leave you if you look me in the eye and swear that you do not love me! Tell me you do not want me, Erik, and I shall die an old maid!” She waited for his reply, but heard only the sounds of the grotto’s dripping water as he remained silent. Clutching her skirts and sucking in her breath, Christine whirled around to confront him, startled by the vision that met her eyes. He stood stock-still as she approached, his face was drained of color, with his eyes revealing nothing of his thoughts. He made no attempt to speak, retreating beneath the shadow of his fedora and the deep folds of his cloak. She hadn’t realized how much thinner he had become. He was so physically diminished and pale that her heart ached for him. Suddenly, Erik felt himself thrust into an unreal world, yet as he looked about his rooms nothing had changed. Steamer trunks were still lined up in a row half-packed, and unlatched suit cases lay about haphazardly with their contents in need of further organization. Candles flickered throughout the chambers, and the lake water lapped quietly along the shoreline, as the boat rocked gently against its mooring. The monkey music-box, with its haunting simian smile, was still perched atop the library shelf. The mirror which had served as Christine’s portal stood against the back wall, as its glass reflected nothing more than routine surroundings. There was no Phantom glaring out of the mist. There were no warring voices in his head or ghosts lurking in the vaults. There was nothing out of the ordinary that he could see, with the exception of the young woman who knelt at his feet in tears. No, he assured himself, he was not mad. Christine had taken hold of his knees and lifted her eyes to him. He gazed down upon her then, slowly comprehending the words she had spoken; I shall die without you. I love you desperately! All at once she seemed within his grasp, and the hope he had let slowly fade and die flickered again to life, in visions of a future with the love of his life. Doubt blurred the edges of the vision, but he willed it away. Christine was the apex of who and what he wanted to be. As husband, as teacher and as lover, he would spend the rest of his life loving her and knowing, at last, that she truly loved him. There were a few loose ends to be considered; practical arrangements to be made, but these could be managed with one or two sojourns up to the city. There was the matter of his will which must be amended immediately; his holdings, the country home and his other investments, all to be re-filed and accounted in Christine’s name. A marriage license must be obtained, and he must arrange for her clothing and personal belongings. Apparently she had left the Reyer’s with virtually nothing, and he could not very well expect her to travel with just the clothes on her back. He would insist on a proper farewell to Louise and Meg; and if Christine so desired, her farewells could also include Raoul de Chagny. Erik would book an additional passage for Christine on the SS Cliffmoore, and they would travel to India for a new life away from the opera house. His mind spun dizzily with the possibilities that lay ahead. There was much to do and much to think about, but just now, he could scarcely think! Turning his attention back to her, Erik lowered his gloved hand and bent over Christine’s kneeling form, stroking the top of her head, as his fingers tangled up in her curls. Bending down, he lifted her chin with his fingertip and sighed, breathing in and breathing out with an open mouth, certain that his pounding heart would rip his chest wide open. Taking her hands in his, as if she were a fragile china doll he gently pulled her to her feet until they stood face to face at last. The lovers gazed at one another in direct defiance of each obstacle and every person who had ever sought to keep them apart. All logical thoughts of if, or when, or how or why fled from Erik’s mind as he folded his arms around his beloved. The world outside his grotto with its traditions and judgments came to naught. Pulling her body to his, he cradled her head against his chest, stroking the back of her hair in long lavish sweeps down the length of her ringlets. Christine molded herself along the length of his wiry physique, her damp cheek wetting the fine velvet of his vest. She felt his chest rising and falling as her sobs subsided into faint moans and mewing sounds. Her arms twined about his neck, as she pulled him closer. Reaching up, she tipped the fedora from his head, letting it fall to the rug, then nudged it with her foot and out of the way of her skirts. She smoothed back the hair of his wig, while her other hand cradled his deformed cheek. Erik offered no resistance, nor did he flinch when she touched his deformed features. She regarded his unmasked face for some time without the slightest hesitation or hint of revulsion, then nestled her head against his shoulder with a heavy and contented sigh, as his arms braced firmly around her body. Neither spoke in that moment. Their eyes had communicated all that needed to be said. He held her in his arms, knowing that she alone held the power to heal or to mortally wound him. She had destroyed him once before, and she could do so again, he cautioned himself, but he no longer gave a damn. He inhaled sharply and surrendered to her power without reserve. Let her destroy me if she will. Better to be destroyed by her love than to have never known it. Gently disengaging from her clinging embrace, he held her at arm’s length, with some part of him still unconvinced that she was flesh and blood. His eyes pored over her body, then lingered on her face, worshiping the porcelain skin and petal mouth. “Christine, my Christine,” he chanted, his thumbs gliding over her moist cheeks. Before she could complete her sentence, Erik lowered his face to hers, his arm slipping up from her waist and his fingers spreading firmly across her backbone. Shifting his weight from one leg to the other and tilting his head, he cradled the side of her cheek with his hand, kissing her forehead and then skimming kisses across her eyelids. She pressed herself closer until his knee brushed her thigh, and a shiver of pleasure prickled her skin wherever they touched. She breathed in the smokey aromas of his scents mingled with her own softer mimosa. It struck her as a miracle that she was wrapped there in his arms where she had longed to be for so long. There was no confusion in her mind now, no doubts or apprehension. She felt his chest firm against her, and her entire body seemed to arch toward him. He was all she needed, all she wanted, and she felt her body and soul coming alive. The tragic years of her childhood were brushed from her mind like cobwebs swept down from a doorway. Her father, who had been the center of her world and the subject of her deepest hurts, now receded into a warm and comforting memory. She could still see his beloved face, but instead of features contorted and dusky with death, she saw him as he had been before the fever made him ill.
She no longer viewed him as the perfect icon of a motherless girl’s desperate need for love, but a man like any other, who had done his best to raise her and care for her. And in the end, her father had unknowingly led her to Erik. He had given her into the care of Louise, and Louise had brought her to the opera house; and then the Angel of Music had come through the mirror. It was Erik now, Erik and not the ghost of her father. Erik had become the center of her world and the heart of her passions. She wondered if her father would have approved of her Angel had he known him, but a father’s approval no longer mattered. Her love for Erik needed no one’s approval. She loved him wholly and completely, and his would be the last name uttered on her lips before the grave. His eyes sprung open and he fixed his gaze on her with startling intensity. He exhaled sharply and cupped the back of her neck with his hand, staring into her irises, his heart riven by their beauty. Closing his eyes, he leaned in and kissed her lips tentatively, until she shuddered in his arms, wilting against him. Erik could scarcely breathe or think. It was all happening so fast and he was uncertain how to proceed. When Christine had left with de Chagny the night of the fire, he never thought to kiss her again. He never expected to feel her nearness, or to feel himself aroused with her touch. She was like an angel in his arms, warm and delicate; fragile and aglow with sensual beauty. He backed out of their embrace abruptly, with the muscles of his thighs and buttocks contracting, while he fought down the urge to take her to his bed immediately. How could he resist, knowing that she wanted him, and knowing that every time he touched her she responded with her own feminine yearnings? Was now the time? Did either of them have any notion of what lay before them in that oft empty four-poster bed? He had hoped to properly marry her before bedding her, but how the devil could he possibly deny himself what his body and soul craved above all else? Christine’s fringed eyelids quivered, and her lips were swollen from his kiss, her face jeweled with sweat. Her hair was a tangled mess of damp, auburn and golden curls, and the candlelight haloed her doll-like features; the delicate contours of her cheek aglow like a crescent moon. He stared down at the hollow of her neck and the soft ivory swell of her bosom. He wanted her recklessly. Ripping the opera cloak off his shoulders with a violent jerk of his arm, Erik gritted his teeth and cursed under his breath. The cloak fell to the floor in a wide pool of black wool. The leather gloves followed, as he yanked them off and cast them down. Erik narrowed his eyes, lunging toward her, a strangled moan emitting from the back of his throat. With the thrust of his hand against her shoulder, he backed her up against the stone wall and ground his body hard against hers. Suddenly, his mouth crashed down on hers with a ferocity that froze the breath in her lungs. Christine’s knees weakened and buckled from the force of it, but when she cried out his name, he drove his kiss harder, “Christine, I want you,” he moaned. “God, how long I have wanted you!” Groping and grasping in desperation for intimacy, their arms and hands furiously thrashed about one another, with Erik demanding more as his tongue parted her lips. His kiss deepened and widened, possessing more of her as she responded in kind; her fingers digging into his back and her breasts pressing against him. Erik’s body was fiercely locked with Christine’s, her face and figure all he could feel or comprehend, until unexpectedly, he became oddly distracted by a strange sensation he could not account for. As the raging lust cooled slightly, with goose flesh prickling up and down his arms, he opened his eyes and gazed about his rooms, alert to an uncanny sense of magic. He had been a magician of some skill for more than half his life, but his brand of magic was no more than tricks of illusion and sleight of hand. With little more than flash-powder and mirrors, he could makes objects disappear or materialize out of thin air, suggesting the supernatural at work in the world. He could throw his voice into dummies or dolls, convincing audiences of his dark powers. This was a skill he had taken great pains to master with the gypsies, and then later, perfected in the bowels of the opera. These vocal deceptions may have appeared as magic to his audience, but they were merely a clever manipulation of his vocal chords; learned from books and helped along by a gullible crowd. His magic tricks could all be explained, his methods picked apart and examined scientifically…but the magic he felt in that moment while holding Christine in his arms was genuine. He could not define it, nor could he explain it, he could only revel in its mystery. His male desires demanded satisfaction, but a strange peace had settled in his soul. A sense of well being and happiness surprised him as he cocked his ear, listening to the organic sounds of the grotto; water dripping from the cavern walls, the lake rippling along the sides of the boat, and the sound of Christine’s heartbeat next to his own. His senses were heightened beyond their physical capacity as he viewed the world through new eyes. They regarded each other with keen awareness as the candlelight pulsated all around them; mystery and music vibrating throughout the green chamber. Though the organ stood silent with deep indigo shadows falling across the old keyboard, in his mind Erik could hear the music of the foot pedals and fluted silver pipes. She gazed up at him and smiled shyly, her eyes alight with metallic flecks of bronze. “Angel,” she replied softly, stroking his face with her fingertips…. Check this website for updates on the forthcoming release of Book Two! This entry was posted	on Tuesday, December 28th, 2010 at 12:40 am	and is filed under Uncategorized. You can follow any responses to this entry through the RSS 2.0 feed. Both comments and pings are currently closed. I admit that I was feeling a little apprehensive about reading part two after loving your first book so much but after this little bit I am sure that I and everyone else won’t be disappointed. And now this gives me a perfect excuse to re-read The Bleeding Rose again. Thank you so much for all of the hard work that you have put into this and I hope you have a good and safe new year. I’m sorry but I have been on the fence about buying the first book as I have been tricked by good reviews before and have instead found the books lacking. I decided to wait until both books are out to make my decision. However, so far, this looks like the reviews are true and it looks promising. I will continue to wait and get both books at the same time. This is going to be a wonderful book!!! I can’t wait to get it!! First I must read The Bleeding Rose!!! Megan…you cannot read book 2 without first reading Book One! 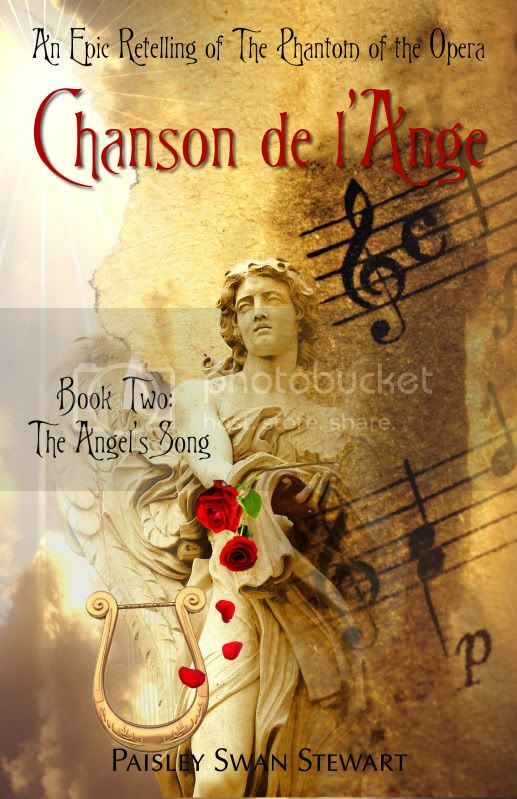 Chanson was never meant to be published as 2 separate books, so Book 2 picks right up where Book One leaves off and flows seamlessly into the storyline! Hi Megan! Hope you enjoy it! Home / Chanson de l’Ange 2011!!! !